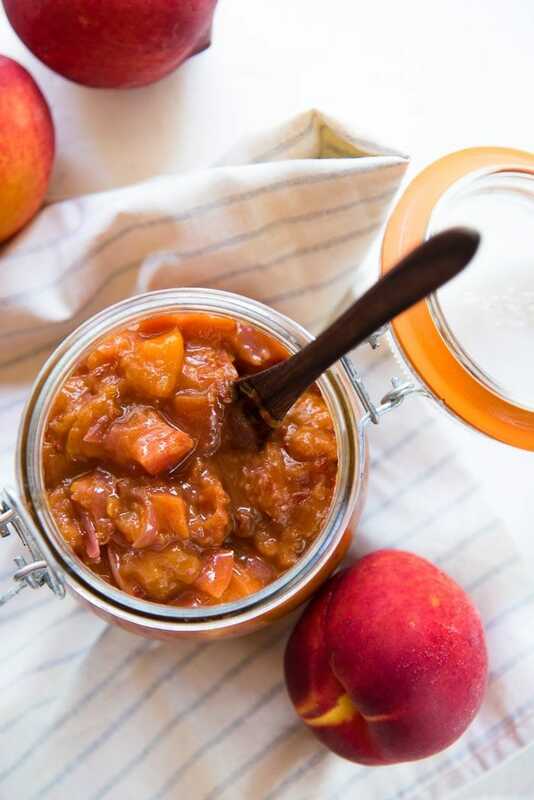 Here’s a great recipe to use up those extra, or underripe, or overripe peaches this season – a Sweet and Spicy Peach Relish! 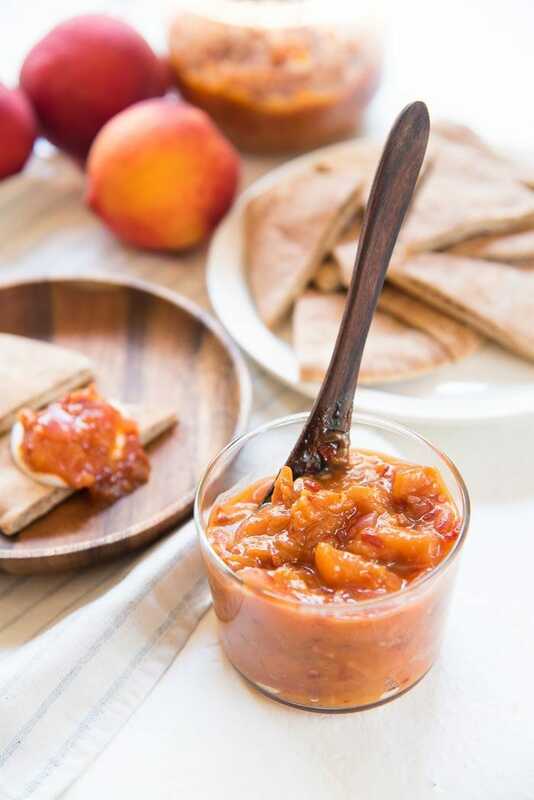 So easy to make, doubles as a peach chutney, and can be customized to your taste! It’s peach season! We’ve been stocking up on them, and invariably end up with a few too many peaches at home. Sounds familiar? Well, here’s something you can do with those extra fresh peaches – a simple, delicious Sweet and Spicy Peach Relish! 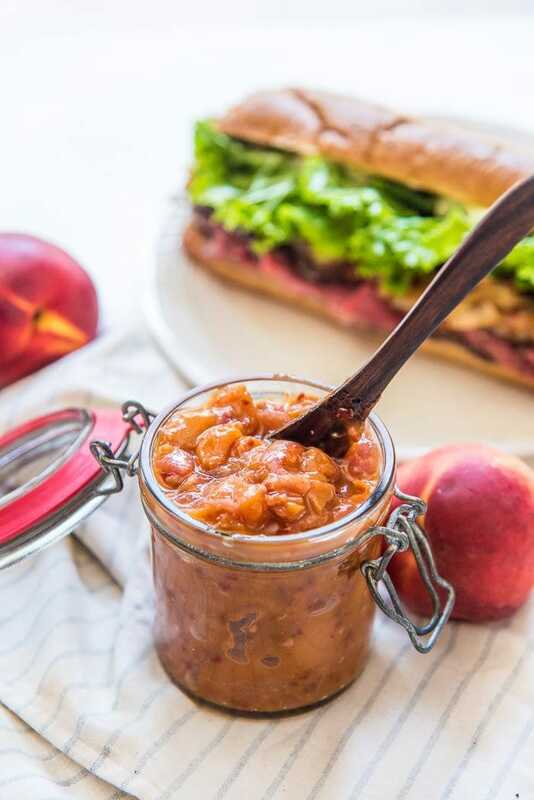 This sweet and spicy peach relish is super simple to make, and it’s a great summer relish to pair with absolutely anything! This doubles as a peach chutney as well, and it’s super versatile, so you can add more flavors to customize it to your taste. 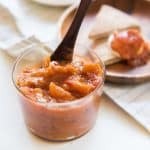 To make this relish, you can use peaches that are not quite ripe yet, or those pesky peaches that are ripe, but just aren’t sweet (I can only seem to get my hands on these lately at my local grocery store), or those peaches that are a little overripe. Basically, any type of peach that you’d rather not be munching on. You can adjust the taste of the peach relish by adjusting the level of sugar or lemon juice. The result is a sweet, tangy peach relish that perfectly complements grilled chicken, grilled pork, grilled seafood, sandwiches, burgers and more! And with a couple of additions, you can get creative with your relish and kick it up another notch. I’ve been eating this relish with toasted pita chips for lunch lately, and it’s so addictive! 🙂 It’s great in my chicken salad, and my husband’s steak sandwiches too! With so many different ways to customize this recipe to your taste, it’s a great way to use up those leftover peaches! This sweet and spicy fresh peach relish (or any variation of it) is perfect for canning too. 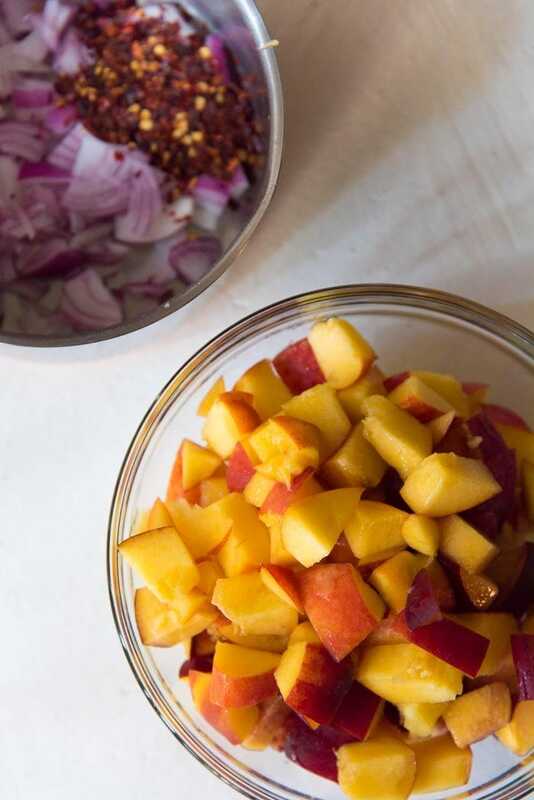 If you liked this sweet and spicy peach relish recipe, don’t forget to subscribe for new (and free) recipes by entering your email address on the side bar (and get all these recipes delivered straight to your inbox), so you don’t miss out on a thing. You can find me on FACEBOOK, TWITTER,INSTAGRAM, PINTEREST, YOU TUBE and GOOGLE-PLUS too. 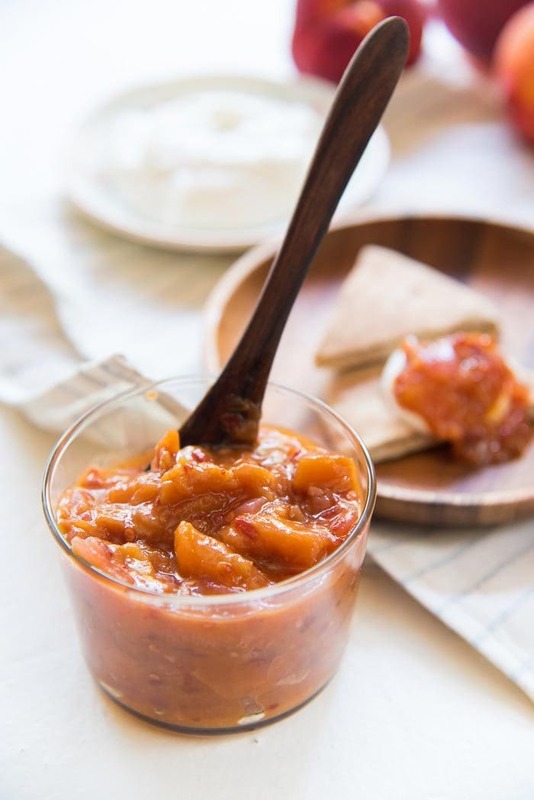 Here's a great recipe to use up those extra, or underripe, or overripe peaches this season - a sweet and spicy peach relish! 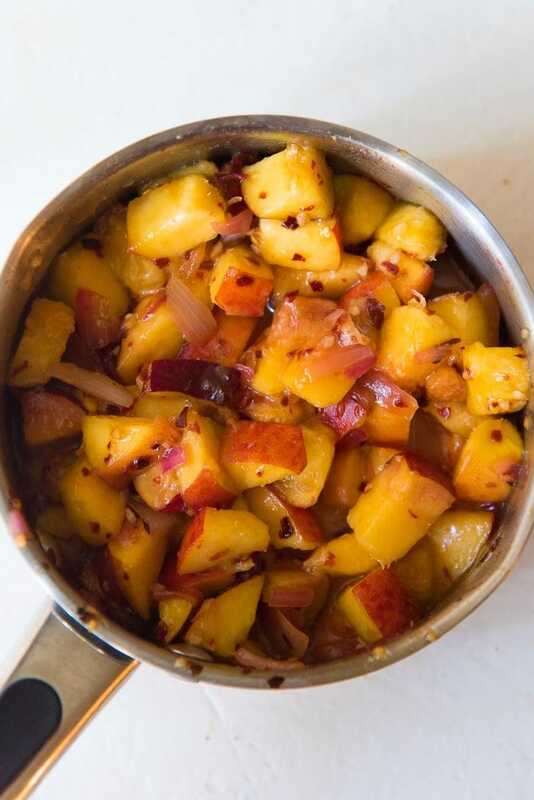 So easy to make, doubles as a peach chutney, and can be customized to your taste! Place the onion, sugar and lemon juice in a saucepan. Heat over medium-heat while stirring to melt the sugar. Cook for about 5 - 10 minutes until the liquid thickens and has a syrup-like consistency. Add the salt, crushed chili flakes and cubed peaches. Stir to mix. Heat over medium-heat while stirring frequently until the peaches soften, and the liquid is mostly evaporated. This may take about 20 - 30 minutes. Scrape the relish into glass jars and serve as needed (can be stored in the fridge for about 5 - 7 days). This is excellent as a topping on so many things, but I really just want to eat it with a spoon! LOVE the sweet and spicy flavors that mingle together in this relish!